Barcelona doesn´t stop. It is exactly the definition of a living city, there is always something going on. Get use to see people in the street talking, at the terrace, parks, cafes… If you get bored in Barcelona, you are definitely doing something wrong! Time needed to visit Barcelona: 4 days, if you really want to enjoy the nightlife maybe add couple of days more. El Raval is directly west of the Gothic Quarter. El Raval has had a reputation for many years as a seedy area that is home to criminals and prostitutes, however, recently the tourism in that district has been growing. El Raval has become a must-see area of the city. Nowadays, a large portion of the population in El Raval are immigrants. In El Raval you will find diversity, plenty of ethnic cuisine, shops, and bars that ask to be explored. El Born is one of the most artistic neighbourhood in Barcelona. You will find plenty of tapas bars, restaurants, galleries, cool cafes, and vintage shops. This district is also famous for his nightlife. Simply get lost is the best thing you can do to explore it. El Gòtic in this district you can find The Cathedral of Barcelona. Sundays around 12 pm you will normally see the traditional dance from Barcelona in front of the Cathedral. Las Ramblas, this is the most visited tourist area in Barcelona, that´s why is also called the street which does not sleep, it´s busy all day and night. It’s also one of the biggest pickpocket hotspots in Europe, so be extra vigilant. The cafes and restaurants are very overpriced. 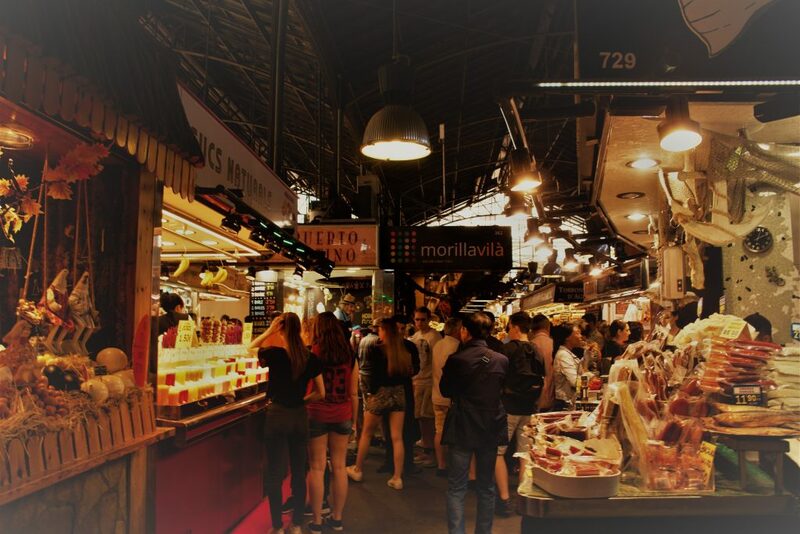 La Boqueria Market is a big indoor market located just in Las Ramblas, and it’s been rated the best market in the world. It´s not so overpriced, really busy but it´s an experience worth having. If you are already in las Ramblas, don´t miss Plaça Reial, is a beautiful square and not that crowded like Las Ramblas. Gràcia, this bohemian neighbourhood is located on a hillside, so it offers great views of the city. You’ll find plenty of trendy shops, bars, outdoor cafes, and restaurants. If you are in middle of August in Barcelona, check out it´s festival, Festes de Gràcia, is worth to hang around and see it. Barcelona has 8 different beaches and all of them with an easy access, equipped with all the necessary facilities and services. 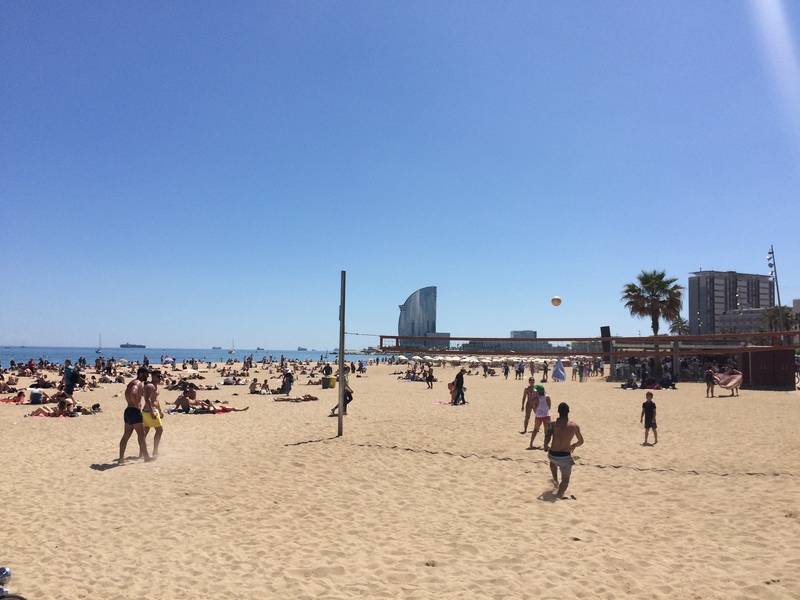 The most famous one and nearest from the city centre is La Barceloneta. La Platja de San Sebastià, is the second nearest beach from city centre after La Barceloneta. Platja de Bogatell, Platja de la nova Icària, Platja de la Mar Bella, is the favourite one for young people, it also has a nudist area. Platja de la Nova Mar Bella, it´s also called women´s beach, more than 60% of the visitors are women, very quiet beach. Zona de banys del Parc del Fòrum, a new concept of beach, without sand. Platja de Llevant, the newest beach from Barcelona. There is one thing you need to know about the nightlife in Barcelona. It doesn’t get started until about 12 pm. People start to have dinner at 9 or 10 pm and you’ll be able to find people eating in restaurants until midnight. The bars are busy from midnight until the early morning and the clubs until 6am. Barcelona has options for everyone and every day of the week. Bars: L’Ovella Negra (The Black Sheep). Tips where to sleep, where to eat and drink, what to see and how to visit Barcelona. Try to avoid Las Ramblas as everything is overpriced. Just walk to the gothic district and you will get plenty of great little restaurants, bars, bodegas and cheaper than Rambla´s price. There is a street called Carrer de Blai in the neighbourhood of Poble Sec. The street is full of small pintxos restaurants (Basque-style tapas) where you can get pintxos for 1€ and beer also for 1€. Fun place to eat cheaply. El Tomàs de Sarrià, you need to try the best homemade patates braves in all Barcelona. You will not find in all Barcelona patates braves cooked in this art. Parc Güell, one of Gaudí’s masterpieces, it´s free, but the Gaudi section requires an admission fee. Parc de la Ciutadella, is no ordinary park, a lot of elements will surprise you in this amazing central park in Barcelona. You will find also at one side of it the Barcelona Zoo. Casa Batlló, one of Antoni Gaudí’s masterpieces and a recognized modernist building in Barcelona, at night will be illuminated so you can better appreciate the facade and it colours. If you want to get in, I extremely recommend you to buy tickets online in advance if you don´t want a queue up for a long time. Montjuïc, a 185 metres high hill, an excellent viewing point over Barcelona. You can enjoy exceptional views of the city, port and coastline. You will also find there the Plaça d’Espanya, the Magic Fountain, the Palau Nacional, the Poble Espanyol, or Spanish Village and the Olympic Stadium. 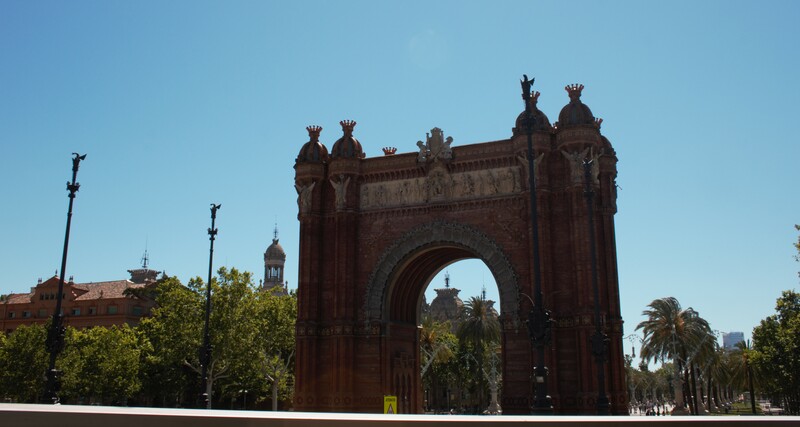 Arc de Triomf, it has become one of the city’s iconic landmarks. The Arc de Triomf rises up majestically at the top of the Passeig Lluís Companys. Perfect for enjoying a walk. Museu Picasso, all Sundays free from 3pm and on the first Sunday of the month entrance is free to all, use this opportunity if you can. Join a walking tour for free based on a tip and it´s also a good opportunity to meet other people if you are travelling alone. Normally they are offered in Spanish and English. Rent a bike for around 6€ per day. You can buy a T-10 metro ticket for less than 10 euros, which gives you 10 rides for less than 1 euro each. The Barcelona bus touristic, exceed the Backpacker budget but is definitely a way to see a lot from Barcelona in a short time. Saving with the Barcelona Card. The Barcelona Card is the ultimate City Card: save money and time with free use of public transport, free admission, lots of discounts and entry with skip the line. We hope you like our Barcelona Born Backpacker Guide, follow us there is more to come! You have chosen a fantastic city to start this adventure. Thanks Lluís!!! Good to have you with us! Thank you Marta! And welcome to Born Backpacker! Saludos a Gemma que es una pasajera frequente que tengo desde Munich! Gracias por tu comentario! Si quieres estar al día cuando subamos nuevos artículos dale a me gusta y abónate en Facebook. TheSterlingTraveler! Thanks for your comment and welcome to BornBackpacker! So pretty! Barcelona is on my list of places to visit! Swati! We love Barcelona too! Thanks for your comment and welcome to BornBackpacker! I really love that you wrote about specific places instead of just highlighting one part of this beautiful location! I’ve always wanted to go to Barcelona and this just gives me so much more information!! Very interesting post and I learn’t so much in this post about this lovely country. Hi Juli! We are happy you liked! Thank you!!! I hope you have the change to visit this incredible city! El Born sounds like my kind of place! But I would love to visit some Cathedrals as well. 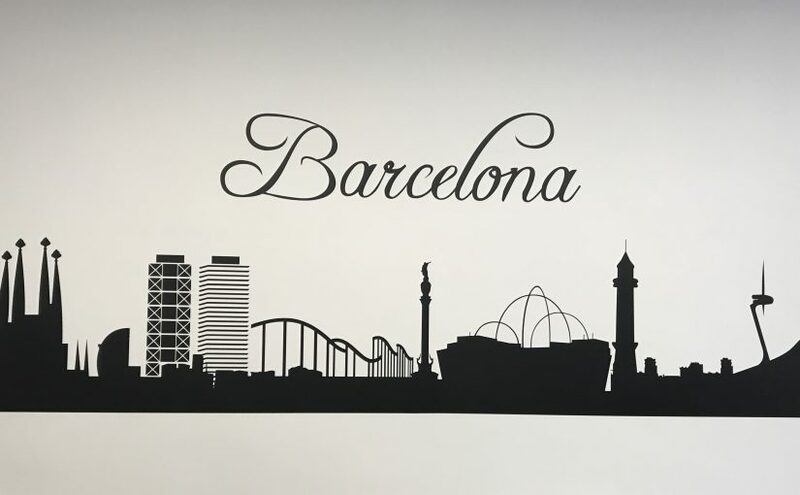 Thank you for such a thorough review and guide to Barcelona. El Born is also our favorite zone in Barcelona!We are glad you like it! I love Barcelona and that is a great guide to the city! Wish I had your guide when I visited for the first time. We are glad you find it interesting! I love this. Definitely adding Barcelona to my list. Hi AJ, welcome and thanks for your comment! We love Barcelona too! Hi Laura, thanks for your feedback and welcome to born backpacker!